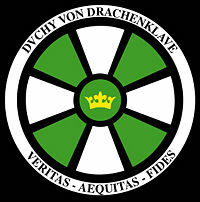 The Duchy Von Drachenklaue, or VDK, is a confederation of 37 separate households (or Hauses) that have united under the house of Duke Lucan and Duchess Yana Von Drachenklaue. Most (not all) of the Sub Hauses have adopted the green/white/black of the "tagma" as their field device, and fight as a formidable unit as part of the 1st Division of the EK's Northern Army . Members of VDK can be found from New Hampshire to California to Texas and Florida, though most are settled in the Kingdom of the East. Von Drachenklaue literally translates as "the dragon's claws", as it was born from Master Feral's household: Silver Dragon. Order of the Cataphract, (Appearance) unbelts who display authenticity in armour. The principals were Artorius and Diomedes. Order of the Equites, (Alumni) member of Chivalry who was a previously a member of the Order of the Cataphract. The principal was Artorius. Order of Feral (Service) service and dedication to the running of the Duchy. The principals were Caoilfhionn and DeVos. Order of Balfar (Fighting) dedication as a warrior to the Duchy. The principal was Dunkin. 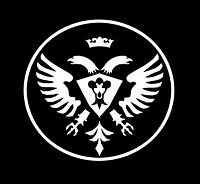 Order of Polaris (Leadership) - exceptional leadership within the Duchy. The principal was Brennan. Order of LeNoir (A&S) for recognition of the Arts and Sciences - The principal was Khatife. The gift of the Amber (Service award) voted on by resident peers at Pennsic. 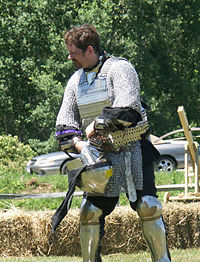 To recognize those who go above and beyond to help set up camp in the first week of Pennsic. The Horn of Valor given to the combatant on the field at Pennsic, having done a heroic deed, that most was discussed throughout the year. This honor was first given to Karl, for his Elf like ability to dance over the head and shield of the men in line while slaying many foes. This page was last edited on 31 March 2019, at 18:04.